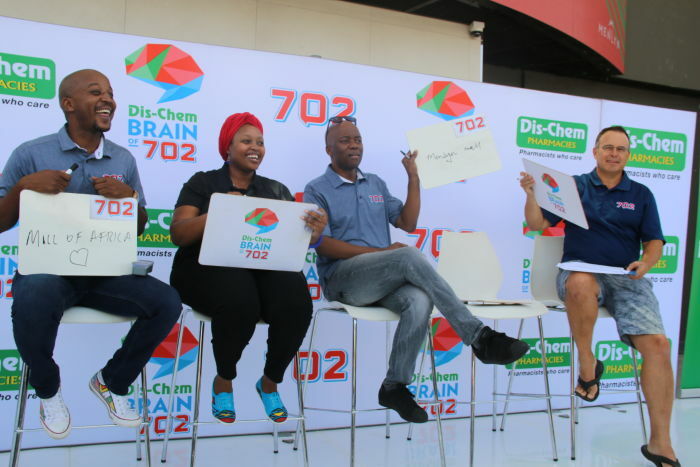 Menlyn Park Shopping Centre was abuzz this Saturday as the Dis-Chem Brain of 702 quarter-finalists from the week battled it out for a R5 000 cash prize and a spot in the semi-final round which will take place at the end of February. However it was Sean Leather from Pretoria who came out victorious answering a total of 14 questions out of 18 correct which was the top score for the day. It was a lucky day for sure for Leather, who entered the wildcard round with the audience before the real action began. After winning that, he was eligible to replace a finalist from the week who couldn't make it. The mall activation proved nothing less than exhilarating for spectators, players and even the judges. It was a fun-filled event where listeners got to mingle with their favourite 702 Presenters. 702's Tshego Modisane and Relebogile Mabotja and were the overall judges making sure no stone was left unturned in the attempt to crown the ultimate fact fanatic. Sean was given 90 seconds to answer a train of 18 questions from the Money Show's Bruce Whitfield who was the quiz master for the day. The Ph.D. candidate beat Export Manager Clement Mzwakhe, 27-year-old Tumelo Selekane, Lindiwe Magagula and Model developer Letsatsi Pole. Dis-Chem #BrainofBrains sees Cape Town retaining their title in a well-contested battle.